The unintended pregnancy rate in the U.S. is at a historic low; however, the rate remains high compared to other developed nations with nearly half (45%) of U.S. pregnancies unintended. Federal funding through the Title X program aims to decrease the number of unplanned pregnancies, increase optimal birth spacing, decrease sexually transmitted infections and improve birth outcomes in the U.S. through the provision of voluntary, confidential, and low-cost education, counseling, and related comprehensive medical services. The Title X program is comprised of 90 agencies that oversee 4,000 sites that collectively serve over 4 million clients each year. As it nears its fifth decade, the Title X program faces the challenge of providing services of the highest quality while adapting to and thriving during a period of health care transformation and innovation. 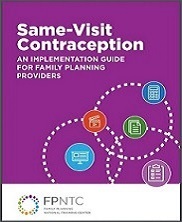 Under a cooperative agreement with the HHS Office of Population Affairs, JSI manages the Title X Family Planning National Training Center for Service Delivery Improvement (FPNTC) in partnership with the World Health Organization Collaborating Center and the National Implementation Research Network at the University of North Carolina, Chapel Hill. The FPNTC strengthens the capacity of Title X-funded family planning organizations to provide high-quality family planning services. To achieve this goal, the FPNTC provides training, technical assistance, and resources to help transform the family planning delivery system and better support agencies that assist individuals in determining the number and spacing of their children. The FPNTC website (www.fpntc.org) is the primary platform through which the FPNTC supports Title X grantees and their networks of service sites. The website hosts over 300 training resources to increase knowledge, build skills and support implementation and systems improvement -- including 20 eLearning courses, 16 training guides, 75 job aids, 14 toolkits/guides, 65 archived events, and 18 videos as of 2019. Staff at Title X-funded agencies are expected to complete regular training on family planning service delivery. The FPNTC Training Tracking System is a website feature that enables Title X-funded agencies to create and share customized lists of FPNTC training resources with staff and track completion of assigned trainings. As of 2019, the FPNTC website had over 15,000 registered users. The FPNTC hosts national learning collaboratives to increase performance on selected family planning measures, online peer learning groups to support implementation of skills and facilitate systems change, and webinars to promote knowledge exchange. Specialized technical assistance is offered to Title X grantees as needed. Since the beginning of the project in 2016, the FPNTC has reached 90 percent of grantees and grantee networks through its training and technical assistance activities. The FPNTC works closely with the Title X National Clinical Training Center for Family Planning (CTCFP) at the University of Missouri-Kansas City, which delivers clinical skills training and resources to health care providers in the Tile X and related public health communities.